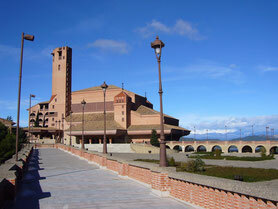 La Ribagorza is one of those authentic and unknown Spanish regions, situated just across the French border. 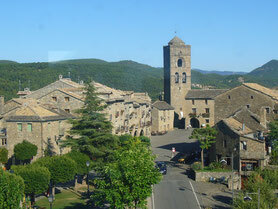 The county (comarca) provides all you could desire from your perfect holiday. A stunning and timeless landscape and a breathless silence. Outstanding flora and fauna. 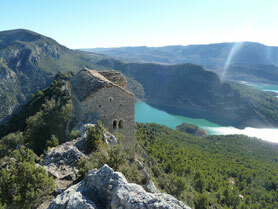 An abundance of hiking routes for both the casual and the serious walkers and a variety of outdoor activities. Rich in culture and historical heritage. Honest, good quality local food and drink at very affordable prices. Friendly and interesting people. All of this under the delight of over 300 days of sun shine every year. In the early times the Ribagorza was it´s own independent county in the old kingdom of Aragón, nowadays it is a region with its own identity, pride and habits. The landscape is of extreme contrasts. 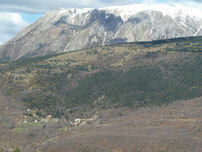 To the north the highest peaks of the Pyrenees, more to the south nice green sloping plains, vines and endless forests. Water always plays an important role. This region is a gem, that not many people know about. 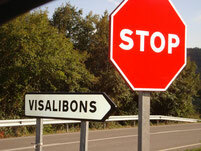 In the Ribagorza the village of Visalibons is very well located, almost in the centre of the region. 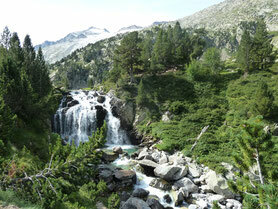 From the village you have easy access to the natural parks PN Posets Maladeta, PN Aigüestortes y Estany Sant Maurici and other very nice and challenging (hiking) regions. 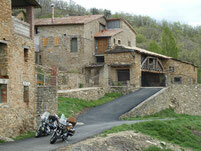 The roads are of an excellent quality and well maintained, for both cars and motorcycles. Casa Álamos is also very well located for those who want to travel the Pyrenees from east to west or otherwise and for those who are on leisure drive on their way to the south or the north, thereby avoiding the crowded motorways along the coasts. The river Isábena cuts through the region from north to south. 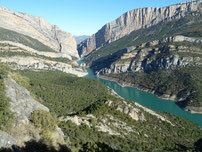 In the north with wild waters and rugged steep canyons but more to the south with green and opening valleys. 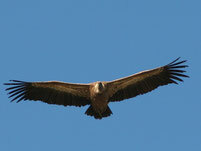 Peace and tranquility are abundant and nature always takes it´s important role in this special environment. 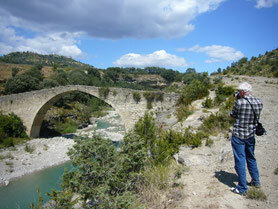 Endless walks, interesting hidden beauty spots and numerous places of interest add to the magic of the region. 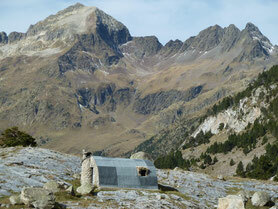 The landscape is dotted with a handful of small and remote villages. Visalibons (at 1100m.) 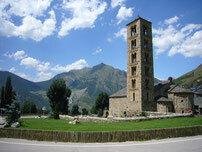 is one of those old and authentic Aragonese mountain villages. 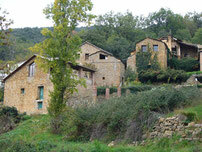 From the village you have a stunning view over the Isábena valley and the sun seems to turn with the village all day. There is always the presence of clear and fresh spring waters; it also runs from our taps. The few scattered farmhouses are big and huge, raised in natural stone and slate and with typical architectural details. 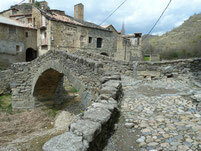 The history of the village dates back to the 10th century.